After almost two years, exactly one biennium after winning his last major title, Rafael Nadal smiled again. The Spanish, 29, beat Gael Monfils in the final of the Monte Carlo Masters and raised his ninth title. The final 7-5, 5-7, 6-0 against the French (after two hours and 46 minutes) meant also his 28th Masters 1000 title, which equals the record signed two weeks ago by Novak Djokovic. Last year, the Spaniard won in Buenos Aires, Stuttgart and Hamburg, junior tournaments, but did not lift a major trophy since May 2014, when he won the Japanese Kei Nishikori in Madrid. The “Caja Magica” was also the background in which until today he had played his last final (May 2015). No one knows better than him the ins and outs of a clay tennis court and on this surface Monfils had never managed to scratch in his four clashes even a set; in fact, never more than three games in a set. All French option was based on his heterodoxy, trying to surprise from that record of agility to try to catch Nadal off guard, whose reliability is far superior in clay. The game invited Monfils to a strong start, but nothing is further from reality. The French, like the Spanish (29 years) and 16th in the ATP, usually a player who tends to tangle with himself. A dangerous amalgamation of plastic resources with those kilometric extremities, but if not, he becomes a very vulnerable rival. This time he went to the counter and opted for a middle way. He began dosed in a rather monotonous version, and gradually became more assertive. As he passed balls, Nadal dominated from his control. Without artifice or boasts, Rafa was taking over the situation. He broke twice Monfils serve (for 3-1 and 5-3), but failed to defend any of those breaks. The Frenchman, very depleted by injuries throughout his career, got angry and increased the pace. He activated and rescued on strides some really hard balls. The Spanish was not interested in entering that game. It suited him to prevent the ball, but from the other side came a succession of deep missiles entangling Monfils. The Parisian embraced by the crowd and avoided three set points. 5-5, tension. 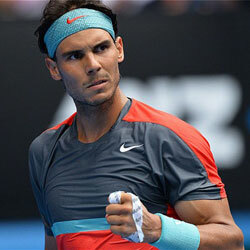 Despite not being able to close the close the set, Nadal did not waver, intense and linear. He defended his serve solvent and finally appeased the vigor of Monfils. And, as usual, the French entangled himself alone, giving several errors and a double fault. It is uncommon to see an exhausted Monfils. Because the physical tone set by Nadal demanded it. This week, in the previous five games, Monfils had remained on track only 5h 43m -in front Müller, Vesely, Lorenzi, Tsonga and Granollers-. This time, only the first set with the Spaniard stretched for 1h 13m. Despite the fatigue, the French resisted. He set his right and tamed the backhand of Nadal, whose service levels dropped alarmingly (retention points with seconds left in a paltry 17%). So, push to shove, Monfils recovered. Despite the fact, his performance is multiplied as the adrenaline index grows; without tension, he broke for 2-1 and immediately after (4-3) Nadal slammed him a break. He returned to the charge the Spanish (68 titles, 48 ​​of them on clay, only one less than the legendary Guillermo Vilas), with more race than tennis this time, but front ran into an emotional torrent that gave off services up to 132 mph to sweep away the lead to prolong the afternoon. By then, the third set, the sun had gone down in Monte Carlo, moisture pasted the track and the ball had lost vigor, circumstance that would not benefit the Spanish. But he did not lose a beat. It was his final number 100, the tenth in the Principality, and the ability to again raise a greater trophy was too tempting. He threw the first service of the French and established an insurmountable border. From there,his efficiency raised to section Monfils (51 unforced errors) and, with a tremendous parallel right, striked his ninth title in Monte Carlo, where at age 16 he raised his first prize. Now, 11 years later returns to clench his fists. And tennis celebrates.